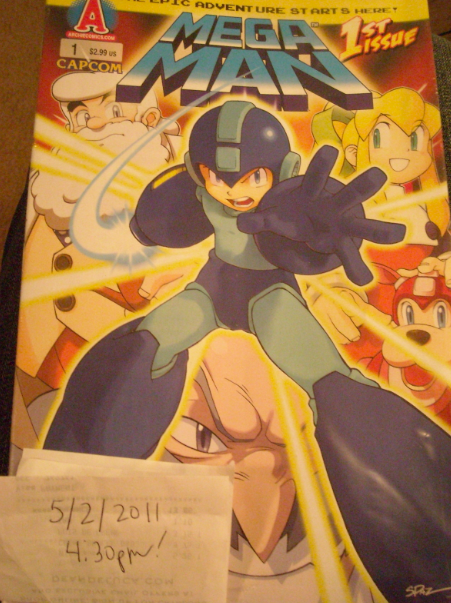 Archie's first Mega Man issue doesn't officially release until May 4th, but already the comic book is hitting mailboxes across the nation. PRC readers Ralene and Tom send word that issue #1 arrived at their homes yesterday, two days ahead of schedule. Archie has set in place two release dates for the debut issue: May 4th for subscribers, and May 11th for newsstands and comic book retailers. For one reason or another, subscribers are getting their issues early. If you haven't done so already, check your mail box... you may be in for a surprise! Both Ralene and Tom have expressed nothing but positive remarks towards the first issue. Hopefully, you'll be able to pass judgment soon enough. Thanks for the tip and photo, Ralene! Can you get both types of covers from newsstands? Are the comic books digest size like Archie comics or are they about the same size as any other comic book? Got mine early as well. I didn't really pay attention the specific release date farther than, "May" so I didn't think anything of it. Now I just need to pick up the variant cover somewhere . . . I went to what is supposed to be an amazing comics store, and not only did they not have it, they had never heard of it. Sounds about right for Mega Man-related media! Ugh. 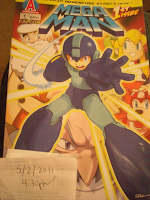 I asked an amployee about Megaman, she said that the store would not get it UNTIL JUNE 30TH! Wall, meet my head!